Sea Lion photo courtesy of Gerick Bergsma 2011/Marine Photobank. Editor’s Note: Another unusual rash of marine mammals have beached themselves requiring rescue operations along the Pacific coastline. 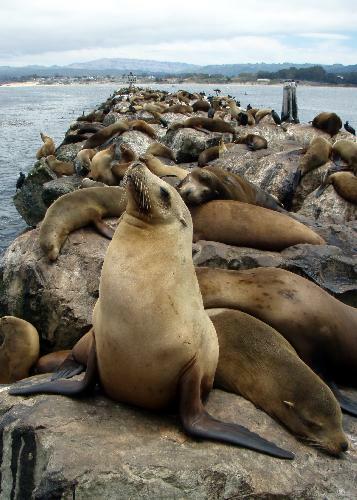 Along the north coast of California, the Marine Mammal Center in Sausalito, reports 429 pinniped rescues as of early May 2014, compared to 291 in 2013. The following condensed news reports are from this May in 2014. …The year started off quieter than last year, and the Pacific Marine Mammal Center’s director of development, Melissa Sciacca, thought they were in the clear – until about a month ago, when the calls started coming in nonstop. The center, in Laguna Beach, is near capacity, with about 100 sea lions being treated so they can be returned to the wild once they are strong enough…It’s the second year stranded sea lions have been reported in alarming numbers. Last year, 370 were treated at the facility, which sits along Laguna Canyon Road. So far this year, there have been 160 rescues. It’s only the third time in the past decade that the center has filled to capacity with 100 sea lions. The first time was in 2009 and the second was last year. The ailing animals show the same symptoms as last year: malnourished and dehydrated, too weak to find food on their own…Executive Director Keith Matassa said the leading cause in likely their food source. It might be something the mother is eating, or a lack of milk, or perhaps the pups are just too small to begin with, and they are too weak to fish. Last year, scientists tested for radioactivity, and it was determined that wasn’t the cause, and infectious disease was also ruled out. The record number of rescues comes a year after Southern California witnessed an almost 70 percent die-off of young sea lions – those born in summer 2012 – near the Channel Islands, where most American sea lions breed. Government scientists perplexed by the hundreds of starving pups washing up in San Diego, Orange, Los Angeles, Ventura and Santa Barbara counties declared an “unusual mortality event” and began an investigation. Previous die-offs were blamed on domoic acid, El Niño conditions and leptospirosis, a bacterial infection. Officials have not directly linked this year’s strandings to the die-off. Sharon Melin, a wildlife biologist with the National Oceanic and Atmospheric Association, said last year’s stranded pups were around 6 to 8 months old – a few months shy of the 11-month point, when they typically venture out on their own. The seals and sea lions beaching themselves in recent months are around the age when they finish weaning after being born last summer. Rescuers say they usually see more stranded pups this time of year – just not in such vast numbers.